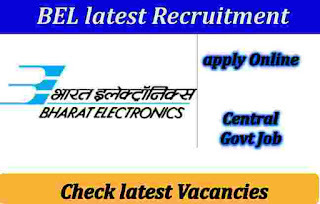 Bharat Electronics Ltd. a Navaratna Company and India’s premier professional Electronics Company is holding WALK-IN-SELECTIONS in Ghaziabad on 20.02.2019 for Electronics Engineers, for its Product support on Contract Basis for a period of one year. BEL Recruitment department also published an official notification on their website related to these Govt jobs for engineer posts. We also share this information on the basis of that PDF file only. We shared the reference link under IMPORTANT LINK section at the last of this article. Requirements: 26 posts for all over India. Also, candidates may be posted or assigned field services in any part of India. Read the whole article below carefully before filling up the application form offline for this BEL Recruitment 2019. Pay band: Rs.23,000 per Month. Educational Qualification: Applicants who have a BE/B.Tech degree with First class for General and OBC Candidates and Pass Class for SC/ST candidates from a well-recognized University of India. Those who have completed their engineering degree under one of the following stream: “Electronics, Electronics & Communication, Communication Engineering, Electronics & Telecommunication, Telecom Engineering can only apply for this BEL Recruitment 2019. Age Criteria: Maximum age limit as on 31.01.2019 is 25 years for General; 28 years for OBC and 30 years for SC/ST candidates respectively. Selection will be through a Written Test on 20.02.2019 (Wednesday) followed by interview (only of those who are shortlisted in the written test) on 21.02.2019 (Thursday). Though, the applicants must come prepared to stay in Ghaziabad for 1-2 days. Registration closes at 01:30 PM. No candidate will be allowed after 01:30 PM. Final Decision of the selection will be done by the management team. 20TH Feb. 2019 is the Walk-In-Interview Date.